There is the option to turn off the 4 up effect and select a shot to display. 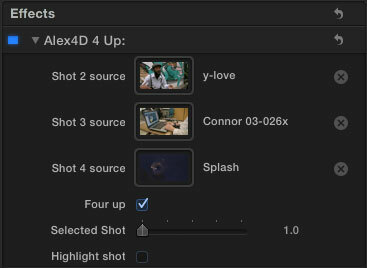 You can also choose to highlight one of the four shots in the 4 up display. Very nice effect. You are on a roll! Here’s my question. It looks great when the clip this effect is dropped on just gets repeated 4 times. But there is a problem when you drag 3 other shots into the 3 drop zones. The new shots always start at frame 1 of that particular clip, no matter what in-out selection or favorite-range you have selected. Have you found a way to set in-points for the 3 other shots? As well as using clips in the event library, you can use clips from elsewhere in your timeline. 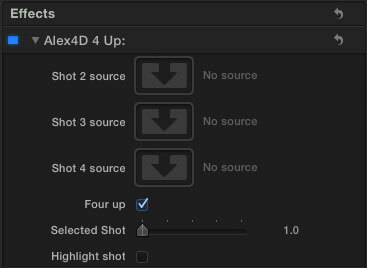 If you do, the clip will display in Alex4D 4 Up from the in point you used in the timeline. I’ve updated the post to show what this can look like in the clip and in the controls. I’m going to try to use this as a multicam workaround shortcut. 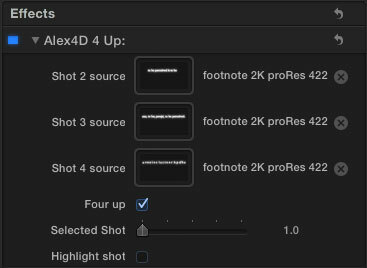 I’ve encountered a bug, when importing four .mov files of stills (generated via Aperture) the #4 clip repeats the same series of images over and over — it represents the first four stills in the .mov file, while the rest of the .mov file is ignored. Very strange. I am new to FCP X (but not to the old FCP). 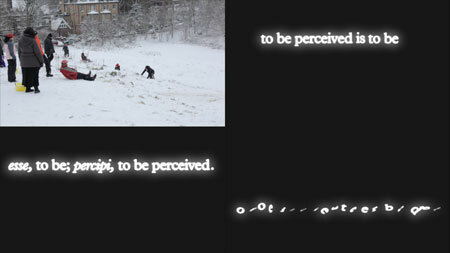 I am trying to use your effect to simulate multi-cam viewing. I have four video clips with two external audio tracks. I set the four video clips to play 4-up, choosing them from the timeline. Instead of playing the clips through, it just loops the first few minutes of video while playing the audio through. I have a sync marker and I am not sure if that could be what is causing the video looping? I am having a very hard time with this new version but desperately need to make this work for a video editing job I am working on. 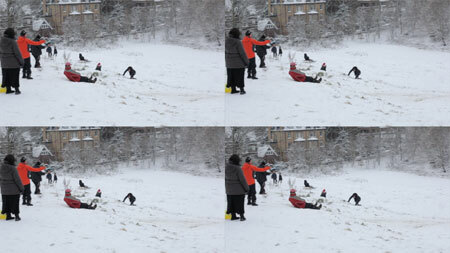 I had same video loop issue with one of the four different clips loaded. I gave up on using the plugin and just transformed each clip to fit the canvas and placed each individually. Once you have them positioned just create a compound clip to lock them together. A short ago I updated the effect, if you click the same link as before above, try the new version. Does this work for longer clips? I’ve found that it works great unless the clips are longer than 10 minutes. After that, clips 2-4 repeat from the beginning, suddenly out of sync with clip 1. Thanks – because this is looking like the next best thing to Multicam editing that any of us FCPX will see until next year! Thanks for a great product.